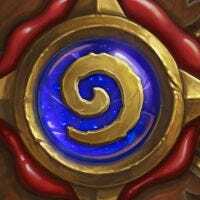 No Hearthstone card is bad on its own. Sure, some underperform in certain decks, in certain metagames, in certain pools of available cards. But time has proven that sometimes, cards that we thought were bad are actually pretty good when things align the right way. 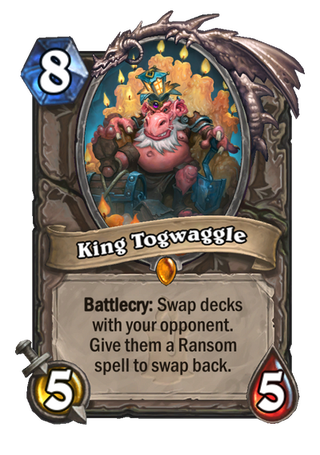 Case in point: King Togwaggle, a Kobolds and Catacombs card that was initially dismissed as a fun-but-not-actually-good “meme” card on release, but has finally gotten its chance to shine in the Witchwood meta. Togwaggle’s mechanic is simple but imaginative: When you play him, you swap decks with your opponent. Potentially disastrous, but not irreversible: If the opponent then draws and plays the “King’s Ransom” card that King Togwaggle shuffles into their deck, they can switch back. At first, players found themselves hard-pressed to find situations in which this mechanic would actually be good, as it essentially meant that your late-game plan depended entirely on what deck your opponent was playing. On top of that, if you wanted to actually mess up your opponent with Togwaggle’s effect, you had to play an otherwise bad deck, which would be extremely risky. For a second, though, things aligned and people found a way for Togwaggle to work, and it all depended on the Druid class’ ability to draw a crap-ton of cards. Filled to bursting with cards that allow the player to draw even more cards—Nourish, Wrath, Branching Paths, Ultimate Infestation—Druids could use their cards to draw almost their entire deck, then drop Togwaggle at the last moment to give their mostly-drawn deck to the opponent. From there, they just had to stop the opponent from switching decks back. One option was to play a card like Naturalize, which forces an opponent to immediately draw two cards, to get the opponent to draw the switch-back King’s Ransom card when their hand was already full, thus burning it. The other, slightly more reliable option, was to use Azalina Soulthief, a card that copies the opponent’s hand, to create your own King’s Ransom card. This would allow you to switch back the deck your opponent had already switched back. If you’ve gotten to that point successfully, your deck’s got a ton of cards and your opponent’s doesn’t, meaning they’ll very likely lose the game. This combo is, as you can probably tell, pretty difficult to pull off successfully, especially in games where the opponent is trying to kill you as quickly as possible. But against late game-focused control decks, which essentially rule the metagame right now, the deck can serve as a pretty powerful counter, which is somewhat of a surprise when you consider how strange King Togwaggle’s mechanic is. 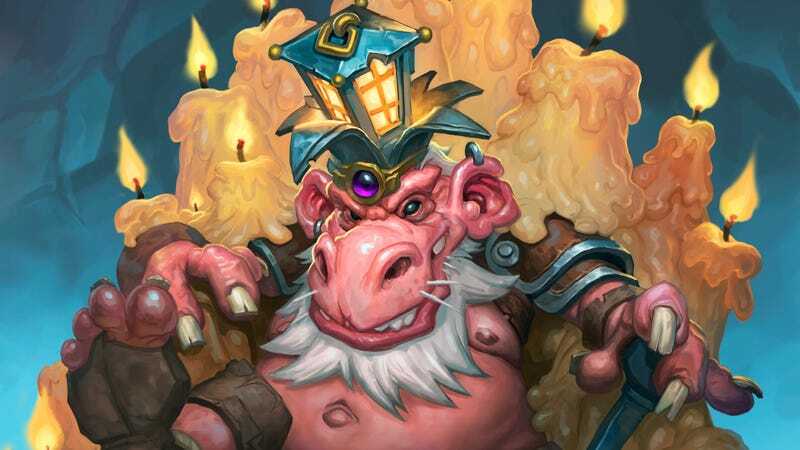 Now, before you log into Hearthstone to craft your own King Togwaggle, I should probably say that while Togwaggle is no longer considered a strictly bad card, he’s not exactly a top-of-the-meta pick either. As it turns out, cycling through a bad deck as quickly as possible isn’t the most consistent strategy, and while a Togwaggle-based Druid can definitely net you some solid wins, you’re typically better off spending your hard-earned dust on Legendary cards with more all-around appeal. Still, if you’re tired of run-of-the-mill Token and Taunt-based Druid decks, Togwaggle decks can be a lot of fun to climb the ranks with.